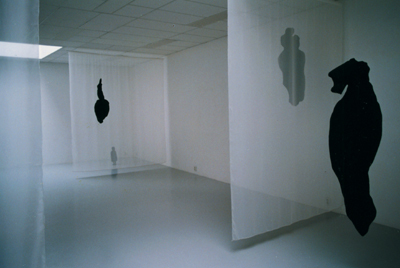 Installation made for the not quite so rectangular space of Argument artists initiative in Tilburg, using semi-transparant curtains to divide the room into several chambers in which black sculptures were placed. The pieces all had female curves and related to each other as family, showing several generations. The small grandmother figure had a central place in the far end corner of the room. The installation made the room a silent, meditative place of contemplation.